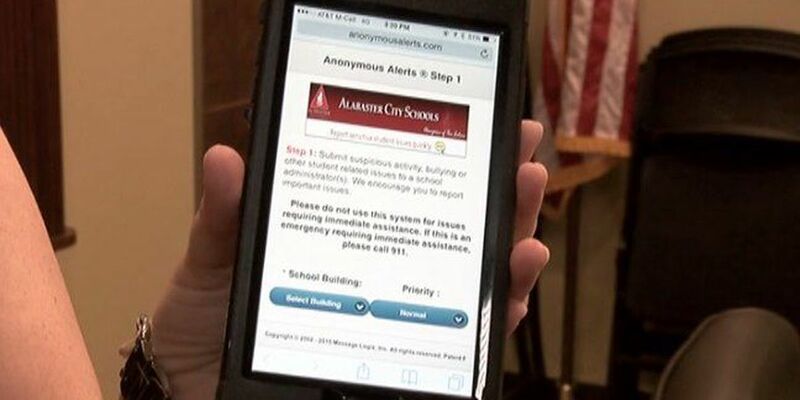 ALABASTER, AL (WBRC) - Alabaster School system officials say a combination of tools implemented just over a year ago is helping to reduce bullying in their schools. Administrators say they've helped students take a proactive stance when they see things happening and administrators have tougher measures in place to deal with situations when they continue. Students have been armed with a new app called Anonymous Alerts. It allows students to text or email their principal, SRO, the superintendent and other school officials about bullying incidents as they happen--allowing officials to respond in real time. Students have been using the tool for over a year. One example of them using it happened a couple of weeks ago: Students were in an assembly, someone was acting out--a student used the app to tell school leaders and the situation was addressed right then. The app is for those who are being victimized. It's also for bystanders, to report what they see and to do so anonymously. It's even for parents who may not learn of an incident until they get home from work. School may be closed, but they can use the app to alert officials and the situation will be addressed the next day. "We live in a world now where you kind of expect instant communication, like texts and emails," Student Services Coordinator Dorann Tanner said. "So this empowers our students, community and parents to have that ability," Tanner said. Also this year, the school system has increased the penalty for students who are caught in severe bullying situations. It was a class two violation and it was increased to a class three violation which can result in "in or out of school suspension," depending on the situation. Tanner said so far, no students have had to be disciplined under this stricter policy.